Innova 3100j Review – Just a Few More Options Than The 3100? 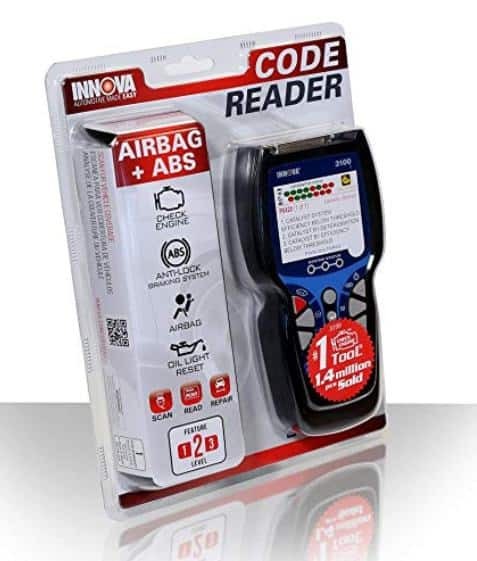 This great device works well for diagnosing your car and seeing the codes included in any issue it may have. If you find that the issue isn't a big deal, then you can also clear out the codes to stop an annoying light from blinking. You'll also be able to fix issues that aren't a huge problem or find a mechanic if that's needed. This tool features the classic handheld design which Innova has used in multiple versions of its scanner. With one hand, you are able to hold and manipulate the device,leaving the other hand free to do with whatever you wish. The screen is small but bright and has enough space to give you all the information you need to diagnose your vehicle. You connect this scanner to your vehicle through a short cable which does tether you to the area around the connection. The connection is what also provides the power to the device. 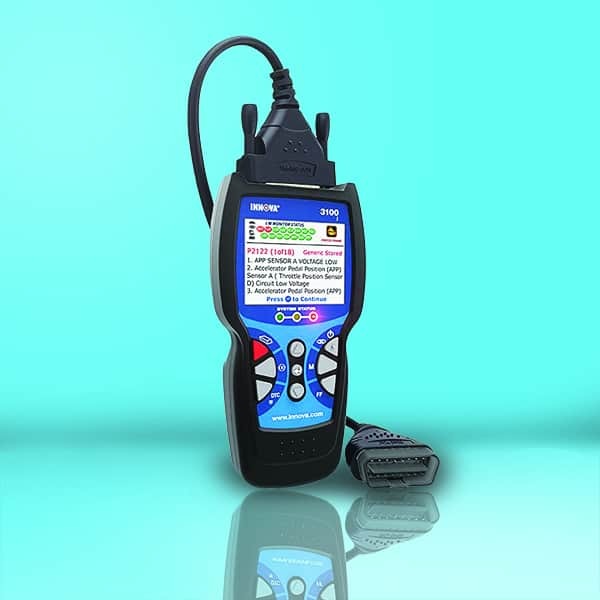 This scanner is compatible with OBD2 vehicles, and there are not many within that group which prove to be incompatible with this diagnostic device. When you come to diagnose a vehicle, your own or someone else’s, you will find that you are able to. You also have the ability to read and erase engine light issues. This device is also great if you are looking for a quick diagnosis for a “check engine” light problem. It will reveal to you the problem, allowing you to either fix it or turn it off if you want to. This scanner offers you ABS and SRS diagnosing. You will also find that you have compatibility with cars, trucks, SUVs, hybrids, and more, made in or after 1996. It is also compatible with almost all domestic and foreign vehicles, making it one of the most comprehensive scanners on the market. You can use this device to check the life of your battery and test the alternator. No longer will you find your vehicle is hard to start or will not start at all. This test will alert you when it is time to change the battery. The interface may be small, but this helps to keep things simple. The interface becomes very efficient and user friendly due to its size. One of the key features is the ability to view live data and graphical information. You can store the last three vehicle checks to look at later. This is great if you want to sit down when you have more time to properly diagnose your vehicle and find potential fixes. It also helps you to track your vehicle over time and look for any future potential problems. If you can fix a situation before it becomes a problem, then you can save yourself a lot of money and avoid headaches. You have oil and battery reset features. This function is great as the device will walk you through how to reset both the oil and the battery in detailed steps. This helps you to maintain your vehicle yourself and avoid costly fixes to common problems and maintenance issues. The scanner is so small and compact that you can easily carry it around with you. It can be stored permanently in your vehicle and also carried around in your pocket if you wish. 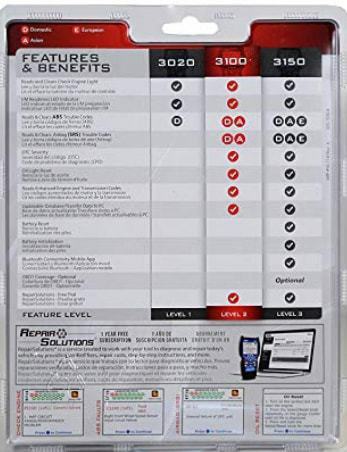 When hooking this device up to your computer for regular updates or to download data, you may find that it is not compatible with some operating systems. Windows Vista is one such operating system which has difficulty with this scanner, and you need to install a software update to get it working. There is a lack of live data displayed during the diagnosis. This information is available after the scan, but there would be a lot of benefit to having that data live which would help you to make a more accurate diagnosis, and a quicker diagnosis too. There are many buttons which can be used, but there is a lack of instruction manual to help you to know what all of the buttons do. This is a great device if you are looking after a number of vehicles as it provides great compatibility. It would be useful for a professional or a novice. The fact that you get clear data which is not too simplistic or complicated also makes this a great device for people of all skill levels. This scanner may not be able to help you with complicated problems, but it will help you find common problems with your vehicle and save you money by allowing you to fix them yourself.